They say Friday the 13th is a bad day in the luck department. I have decided to fight against common thought and turn it into good luck. 13 has always been a lucky number for me. This year, Friday the 13th, May 2011 is incredibly significant. A year ago I decided that by 2012 I would be a full-time writer with at least 1 story published. The story is busy being published in Tales for Canterbury as I write this. I also decided in January this year that one of my goal-resolutions would be to go full-time writing this year. As of 13th May, I can tick that goal off my list. After much thought and contemplation, I decided to put my goals on the line and go full-time writing. This was not done lightly nor was it done alone. I have the support of an incredible family and amazing friends behind me. I also have the wider support network of some amazing online writer friends. Now I know that there are many writers out there who can’t give up the day job as of yet. I made the decision because it is something I have been working towards for 10 years now. I had also got to the point where my writing turned from being something I did in private to something I know that need to do to feel fulfilled. It is sad that of all the professional careers in the world, the creative careers of Artist, Writer, Sculptor, Musician are not taken as seriously. For me, writing is a calling and a gift. It is something that succours my soul and nourishes my spirit. It is something that lifts my heart and fuels my mind. But over the years I realised that if I was serious about this calling, I needed to get serious with it in public. So I sat down a year ago and wrote up some goals. I believe in goal setting but more importantly I believe you must write down your goals and your dreams. Writing goals down cements them in our minds. When I was offered an opportunity to submit a short story to an Anthology, I jumped at the chance. Something deep inside told me this was my chance to put my writing out there in public. This was my chance to show the world that I was serious about being a writer. It was a nail-biting time waiting to hear if I had been accepted and when the good news finally came – I literally jumped for joy. The final moment of realisation hit me when I received my contract. Here it was. My first actual publishing contract. I believe that every person on earth is born with a purpose, a gift, a talent. Some people never find that purpose and tend to jump from thing to thing, searching all the while for something they know is missing from their life. Some people know what their purpose and their gift is but choose not to pursue it. Then there are those few who know what their purpose is and pursue it at any cost. For me, writing is my purpose, my passion, my gift, my need, my longing and my fulfilment. In my mind, I have always identified myself as a writer. But in the real world there are bills to pay and sometimes life throws you curveballs that take you slightly off the track from your purpose. I have had my fair share of curveballs thrown my way. I have also had normal day jobs that I have worked in to pay my bills. But through this all, I have continued to write. But it has been in the last year that this writing has reached a feverish pitch. After working a 40 hour job in management in my day job, I would get home and write every day deep into the late hours of the night and the early hours of the morning. The last 9 months I have survived on little more than a few hours sleep at night. Some people in my life wondered why I persisted in working myself to the bone. How could I describe this burning need to write? How could I explain that even though the world ticked my career as something else, this did not change the fact that in my mind I identified myself as a writer? Eventually the only way I knew that people would learn to understand and accept that I am a writer is if I became a Full Time Writer. 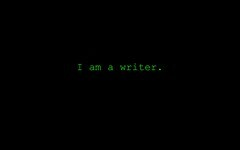 I am a Full Time Writer. Congratulations, I am absolutely thrilled for you. Thanks so much for the link to my blog post. What a true blessing and yes, honor, it is to know you. I was very blessed by reading this. To see others KNOW in their innermost being that what they are doing IS what God called them to do…is such an unspeakable joy. As Draven said, I hope things work out-and I hope all goes as He planned for you. Perhaps you know this, but, if not, it will be my gift for you to take with you into this new life. Hello, just ran into this page from reddit. It is not something I would typically read, but I loved your thoughts on it. Thanks for making a blog post worth reading! Congratulations! You’ll never regret it. Those other jobs are just research, cool things to write about now. I can’t think of any good writers who didn’t have some of those, usually with a few colorful oddities among them. I’m working hard on quitting my last one – Being A Cripple. It’s rough but I will get there to the stage you’re at now. You’ve given me hope that I’ll get there too in my time! Hi, just found your website from digg. It is not something I would typically read, but I liked your thoughts on it. Thank you for making a blog post worth reading! One year and six months ago I made the same declaration without even a pub cred to my name… and now I have two books sold. It’s an amazing journey with lots of ups and downs. But the thing that never changes is the dedication to the work. We are writers. That’s what we do. Thank GOD. We have the best job in the whole world. Congratulations–I’m so proud to know you and happy to have connected! Congratulations, Kim – and best of luck! Good luck in your future as a full time writer. I hope things work out for you and that we see a lot of your writing in the future.You certainly write well, judging by this.